Beautiful Fossil signed necklace. Multi-chain with a faux leather cord slide closure. No serious signs of age or wear were noted. Leather cord shows very slight signs of surface, but nothing serious. Adjustable from 17" to 20" long. FOSSIL JEWELRY. LEATHER-BRAIDED CORD NECKLACE. STAINLESS STEEL PENDANT. PICTURES TAKEN FROM THE EXACT ITEM YOU WILL BE RECEIVING. Adjustable closure chain and clasp also features 3 charms (Key, Padlock, and Fossil logo with clear stone). 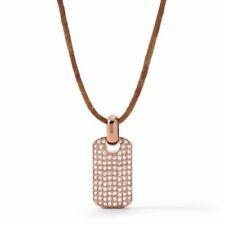 Authentic Lucky/Fossil brand necklace. Mother of pearl pedant on leather cord with silver clasps and adjustment. In Fossil style the back of the pendant is beautifully detailed. Adjusts from about 18" to 20". (A47) Fossil Tree Charm & Black Leather Bracelet. Adjustable from 17" to 19" long. Authentic Fossil Heart Lock pendant necklace with a gold-tone heart lock pendant with crystal accents on dark brown leather cord. Signature embossed lobster claw style closure with a lock, key and pave crystal Fossil signature embossed stone charm. Fossil Key Pendant Dark Brown Leather Chain . Condition is Pre-owned. Lobster clasp. Measures approximately 22 inches in length. Charm is approximately 2 inches in length. Dispatched with USPS First Class Package. What a stunning looking necklace from FOSSIL. Very unique looking and beautifully made. It is accented with SEMI PRECIOUS accents. Fossil charms at closure too. It is an orangey coral pink. S&H is free within the USA. Adjustable from 16" to 18" long. Adjustable from 19" to 21" long and 2" Pendant. If you like their belts and accessories, you will love the jewelry. This great necklace features a brown leather neck strap wi th goldtone lobster claw closure and extension chain and goldtone openwork pendant with natural mother of pearl shell underlay. If you like their belts and accessories, you will love the jewelry. This great necklace is from the Native Sun Collection and features a faceted teardrop shaped white stone on a brown leather neck strap. If you like their belts and accessories, you will love the jewelry. The center circle is accented with silvertone, antique goldtone, and brown ion plated sliding beads. Fossil F logo embossed lobster claw style closure with lock, key and logo stone charms. We'll be happy to help you find just the right designer fashion piece for your needs. NEW PRODUCTS. If you like their belts and accessories, you will love the jewelry. This necklace features 5 strands of resin seed beads (2) and goldtone chains (3) with dark brown leather wrap at the back of the neck. If you like their belts and accessories, you will love the jewelry. This necklace features smooth round, white beads, silvertone crystal pave balls, dark brown leather, silvertone Fossil signature key, heart and lock charms, and silvertone button and leather loop closure. Fossil Multicolor Stone Necklace Goldtone Chain Grey Leather New! NEW PRODUCTS. We'll be happy to help you find just the right designer fashion piece for your needs. Mom is now is gone, but I have all our treasures.and there are boxes and boxes of them. They are all in my crawl space, and I've been taking out and discovering treasures I never even knew I had! Quality made by Fossil. fossil chocker necklace silver with leather trim. Condition is New without tags. Shipped with USPS First Class Package. Dark blue dyed jade beads and chocolate leather cord detail this necklace from Fossil. Collection: Folk. Item Specifics. 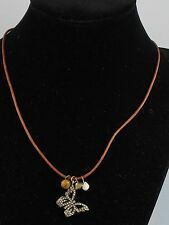 Fossil Brand Silver and Copper Tone Marquis Charm Leather Cord Necklace 18"
Very Good Used Condition. No visible defects. Necklace is adjustable. FOSSIL AUTHENTIC SNAKE PRINT STAINLESS STEEL,LEATHER WRIST BELT STYLE BRACELET. NICE! FOSSIL SILVER TONE AND BLACK LEATHER THREE (3) PIECE LOT!! The first item is a black leather cord with silver ends, adjustable length and fossil charms, and a silver flower pendant. The third item is a black leather bracelet with interwoven silver, and it is also adjustable. 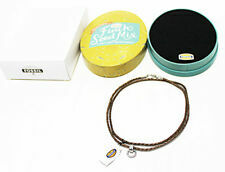 Fossil Brown Triple Leather Cord Necklace With Button Clasp. Condition is Pre-owned. Some minor wear on leather loop that fastens necklace to metal button. See photos for detail. Seems to be cosmetic only. Bought new at Belk. Shipped with USPS First Class Package. FOSSIL AUTHENTIC, BLACK LEATHER/ SEMIPRECIOUS GREEN BEADED NECKLACE. Triple the charm. This toggle bracelet from Betsey Johnson features three rows of alluring glass gems accented with faux pearls. Toggle closure. Item Specifics 7 in length. If you like their belts and accessories, you will love the jewelry. Shake, rattle, and bold. MARKED FOSSIL STEEL. FABULOUS STEEL AND LEATHER NECKLACE. INTERESTING DESIGN. If you like their belts and accessories, you will love the jewelry. 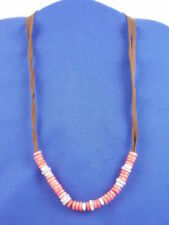 This fun necklace features orange beads on a brown leather necklace with a silvertone lobster claw closure. Of course the Fossil Lock/Key/Heart charms dangle from the clasp. If you like their belts and accessories, you will love the jewelry. 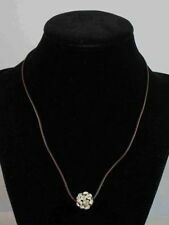 This fun necklace features a brown leather neck strap and a silvertone heart shaped lock pendant with clear crystal accents. Of course the Fossil Heart, Lock and Key charms are dangling at the clasp. 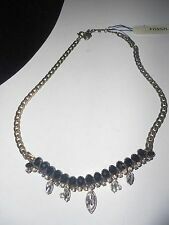 Fossil Mixed Metal Leather Boyfriend Necklace Rondel Beads Pave Crystals New! Dark brown leather with pave crystals and a tiger eye bead accent. FOSSIL NECKLACE. SAVE AS FAVORITE. NEW PRODUCTS. Style: JA4755797. Very pretty Fossil silver tone pendant with leather strap. Note : One pave stone may be missing. 1 1/4" high. You don't need to inherit millions to feel like a queen. 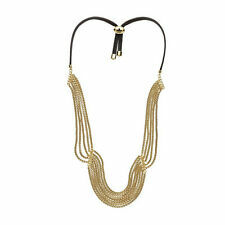 Live out your legacy luxuriously wearing this Modern Heirloom Multichain Necklace from Fossil! Multiple strands of polished silver, gold, hematite-tone chains are layered together, creating an effortlessly chic look. All 3 pieces are NWOT. The rose is about the size of a quarter. FOSSIL AUTH. NWT, BROWN/COPPER TONE, LEATHER, MULTI CHARMS, FOUR SET BRACELET.